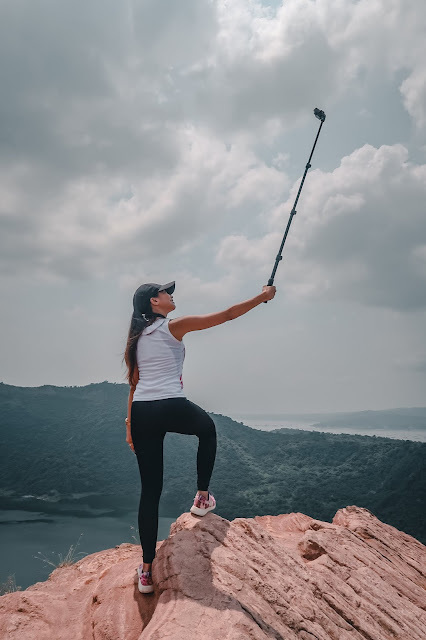 Got a good wide snap of Taal Volcano's crater with my Yi 4k+ action camera mounted on 1.2m monopod. I used to believe that the 'Taal Volcano' that I saw in Philippine post cards and textbooks when I was still in Primary school was the real Taal Volcano. 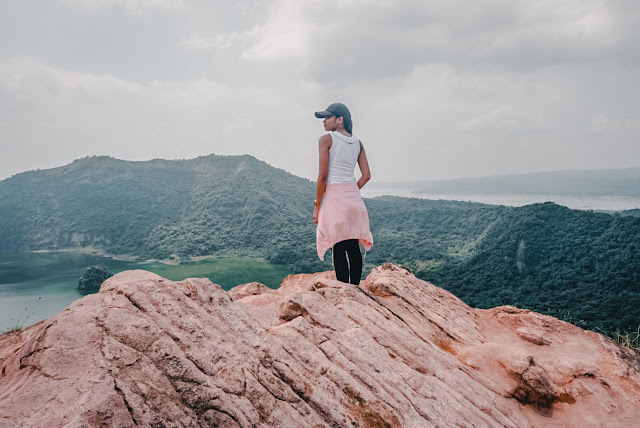 Not until we moved to Tagaytay City and found out that my whole life was (partly) a lie. 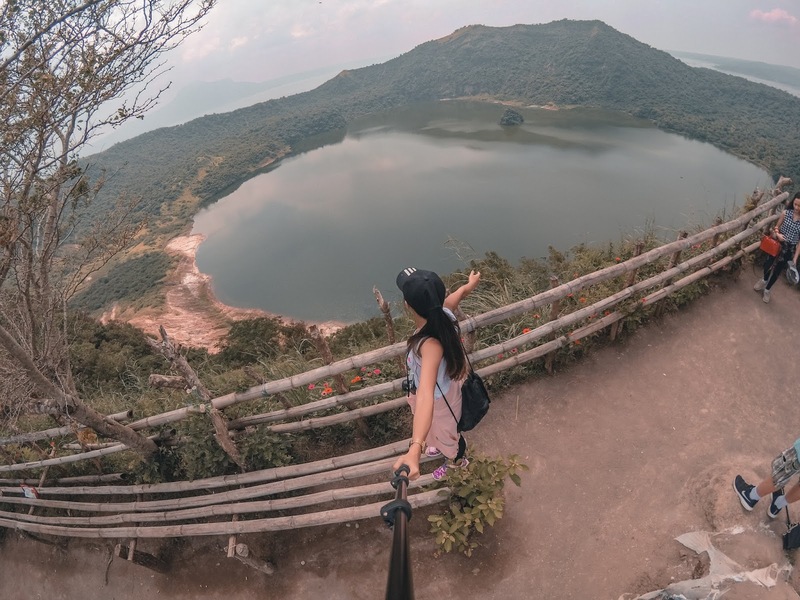 That seriously small volcano was not the Taal Volcano but it's called 'Binintiang Malaki' which is only a caldera of the whole volcano. Taal Volcano is considered to be the smallest active one in the world. It is actually an island in a lake found in an island in a lake (GOT IT? LOL). It was recorded to have 33 eruptions since 1572. Sleeping for a few years now, it has invited tourists to admire and explore it everyday. Most tourists find it amusing to be just dining, sleeping in a room, sipping a cup of coffee in an overlooking balcony with a view of the smallest volcano, The Taal Volcano. While a lot are more than fine admiring it from afar, adventure seekers are not. They'd rather go on a trek and see the volcano up close and personal. From Buendia or Pasay, take a provincial bus bound for Nasugbu, Lemery, Calatagan Batangas. Get off Olivarez Plaza. From the rotunda, charter tricycles that will take you to a jump off in Talisay. 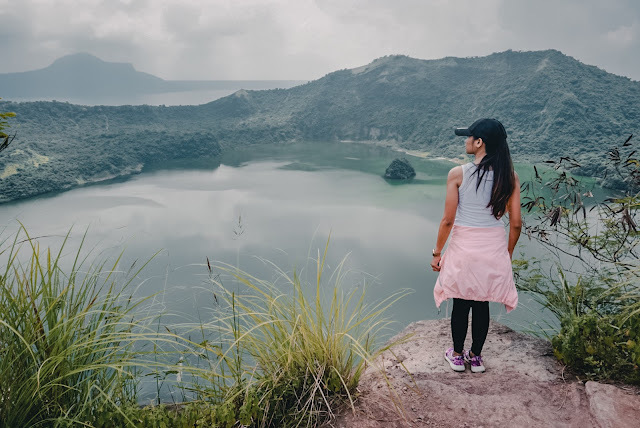 It will take you an hour and a half or two to the crater: 30 minutes from Tagaytay City to Talisay, 20 minutes by boat from Talisay to the foot of Taal and an estimated 45 minutes from the foot to the crater. Tourists usually take this trail. 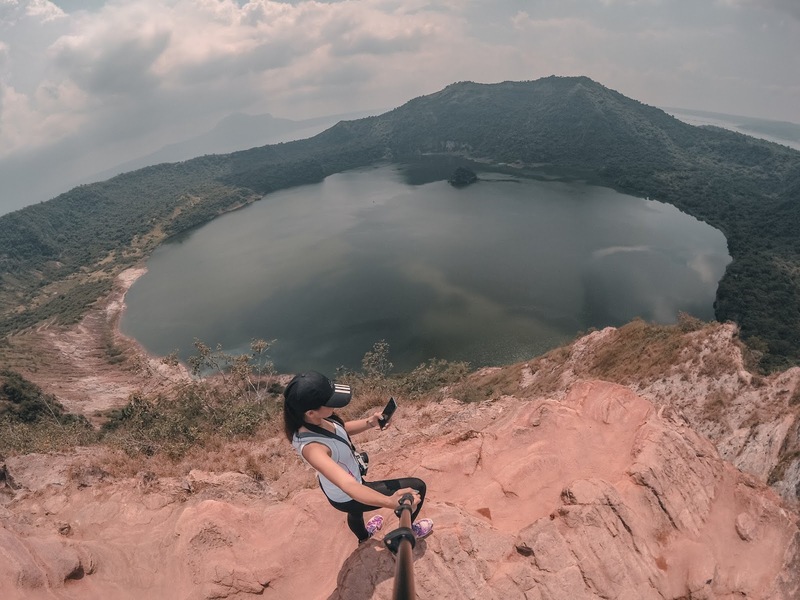 However, some mountaineers and hikers who would really want to explore it are given other alternative routes and jump off to experience the hard trail down into the lake in the crater itself. Since we were in a hotel in Tagaytay City, we opted to join a tour organized by coordinators from L & J Bed and Breakfast. The tour included van transfers from the hotel to Talisay Green Lake Resort and vice versa, boat transfers and registration and guide fee. Red Lava entrance fee and Horseback riding are not included. I found this one more convenient since we were picked up and dropped off by a private van. Also it is quite safer than tricycles since the road down to Talisay is literally long and winding. For inquiries, you may want to contact L & J Bistro, Bed and Breakfast. 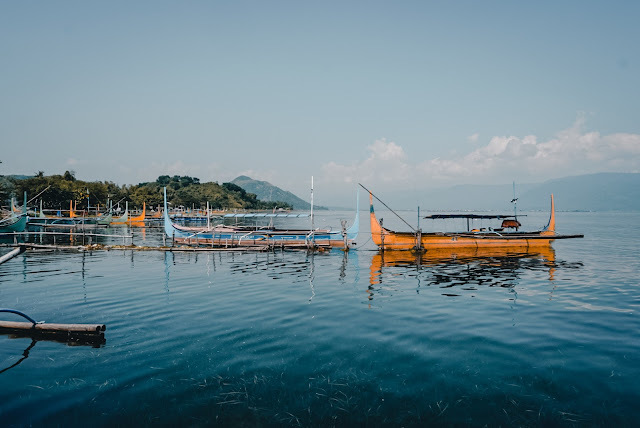 Talisay Green Lake Resort was the jump off to our Taal Trek. Upon our arrival we were gathered for an orientation. Afterwards, we were handed life vests and were instructed to hop into our boat. We left Talisay at around 9:45am and arrived at the island 20 minutes after. We were introduced to the guides then started the trek. The trail was fine though you'd share it with horses too as some tourists would go up to the crater riding a horse. The sun was up glaring at us which made the trek more challenging. We chose to go there by foot. Some trails were shaded but most of it are not. It was also dusty and extremely hot at some areas due to the fumes. We rest for a while to hydrate. There are stores selling bottled water, softdrinks nad even beer along the trek. After 45 minutes, we reached the crater. The exhaustion from the tiresome trek vanished the moment we got a glimpse of the crater. From the view deck, we could see the waters in it boiling. There was also an island in the middle of the crater which is believed to naturally appear in there due to its activity. We expected it to be so hot in there since it was around 11:00am but it was hotter than what we have imagined due to the fumes around. The view deck was a little crowded so we decided to walk around and found another spot which could give us a good view of the crater - The Red Lava. We paid 50php and registered. There was like a 5 minute walk to the red lava from the viewing deck and there we took these dope wide shots with our Yi 4k+ action camera. 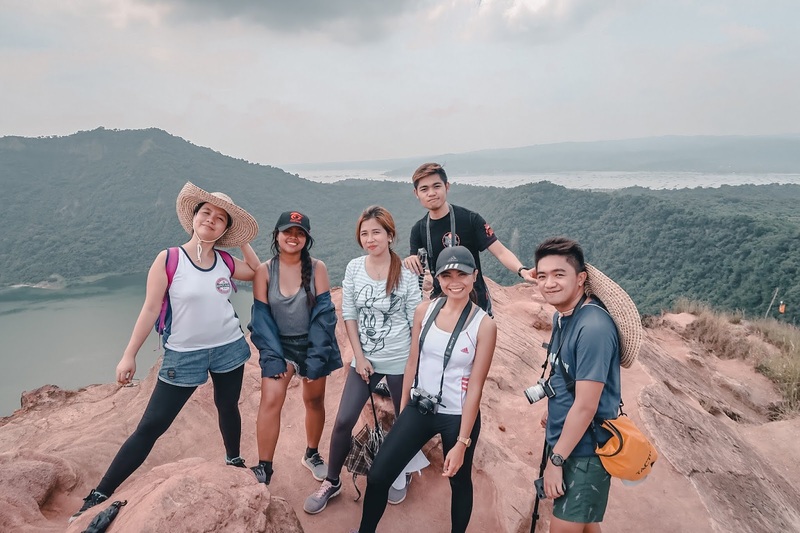 With them blogger friends, (from left to right) Milet Miranda of Project Gora, Riza Acebuche of Rizanoia, Jane and Jerny of The Jerny Travel and Inspiration, MEEEE and Jomar Alameda of BYAHERO SI BES. 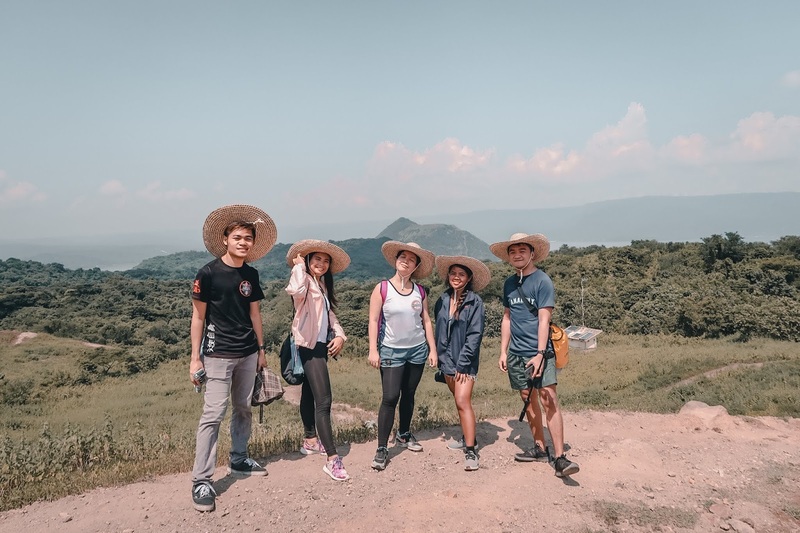 L & J Bistro offers a Taal Trek/Tour where the guests and interested participants// tourists could be picked up in any point of Tagaytay City. The package includes air-conditioned van transfers, boat ride, use of buli hat and life jacket and all of the entrance and permit fees. Horseback riding to the crater (at 500php) and the entrance to Red Lava Trail (at 50php) are optional. These are considered additional expenses therefore will be shouldered by the tourist/ guest. Take note that complimentary breakfast is included in the fee as well as the other tour inclusions aforementioned. 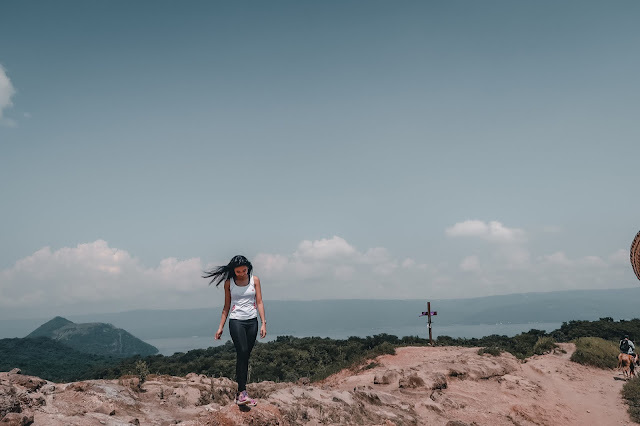 *The suggested itinerary started as early as 5:00am since it gets really hot should the itinerary start beyond 8:00am. Also, this works for those who would also want to go around the city if they only have a day to explore the town. Note that they still accept tourists until 5:00pm. However, view wouldn't be much appreciated since it's getting dark. The waves also get a little violent in the lake making it hard for the boats to dock. -Rain or shine, wear closed trekking or comfortable pair of shoes or anything that is good for a long walk and won't hurt your feet. The trail is dusty and could get muddy on rainy days. -Wear comfortable clothe; also, bringing an extra is highly suggested as you will really get soaked in sweat. -Start early! It really gets too hot up in there. -Bring at least 2L of water.